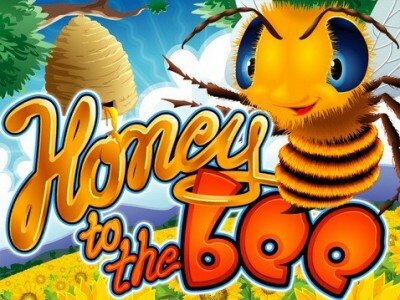 Honey to the Bee is a five reel, twenty line video slot based on the animated world of honey making in a beehive. The top award is 5,000 coins, while the betting ranges from 0.01 to 5.00 coins. The Honey to the Bee symbols complete the fun and colorful theme by using icons of worker bees, a queen-bee, pots of honey, sunflowers, and a beehive, just to name a few. Honey to the Bee has the right stuff: unbelievable production-thought in its audio/visual content but also with some fantastic prizes ready to whet the appetite of any gaming enthusiast. RTG has included its Random Jackpot progressive prize. Placed above the reels, the sum is constantly growing. After any random spin, the entire prize can be “dropped” into your gaming account. Spin the worker-bee wild symbol onto an active pay line, and it will substitute for any other icons, excepting the scatter, to help connect winning combinations. The worker bee only appears on reels one through four, but it is also very helpful. Prizes won with the wild symbol are automatically doubled. The beehive, the scatter symbol, can multiply your total wager. Find 2, 3, 4 or 5 to have your total multiplied by 2, 4, 10 or 100 times. To get free spins, the wild symbol and the scatter symbol must be on reels two and three respectively. With this combination, you will gain fifteen free spins; and any prizes you win in free mode are automatically doubled. It is also possible to win more free spins while using a free spin.